Is Theresa May plotting a secret Brexit plan B to avoid conflict? 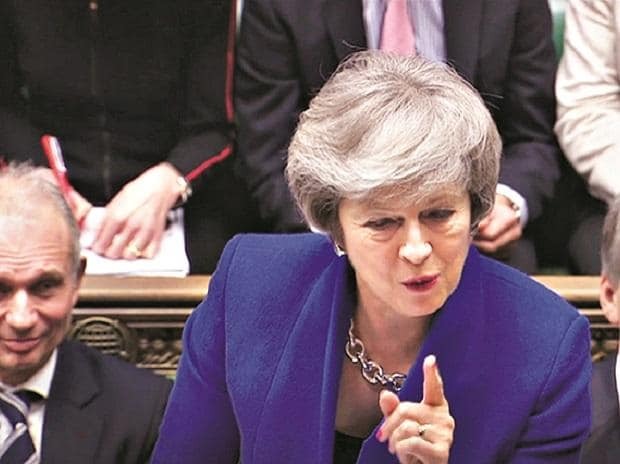 British MPs have voted to reject a chaotic 'no-deal' Brexit, but backed Prime Minister Theresa May's bid to renegotiate the divorce agreement already struck with the EU, setting up a new showdown with the 28-member bloc after it ruled out any change. In a series of votes on Tuesday, lawmakers rejected a no-deal Brexit by 318 votes to 310, undermining the government's argument that Britain would be willing to crash out of the EU without an agreement. However, the vote is not legally binding - meaning it showed the view of the House of Commons but does nothing to change the Brexit date of March 29. Conservative Party MP Caroline Spelman and Labour MP Jack Dromey had tabled an amendment to try to prevent a crash-out exit of the UK from the European Union. With just 59 days to go until Britain leaves the EU, MPs also voted in favour of an amendment backed by the government to seek "alternative arrangements" to the controversial Irish backstop, which seeks to avert a hard border between Britain and Ireland after Brexit. May had said she was backing the amendment to re-open negotiations in Brussels with an "emphatic message" of what British MPs want. The amendment tabled by Tory MP Graham Brady passed by 317 votes to 301 - a majority of 16, which effectively calls on May to renegotiate her Brexit deal with the EU and find an alternative to the controversial Irish backstop. "We will now take this mandate forward and seek to obtain legally binding changes to the Withdrawal Agreement that deal with concerns on the backstop while guaranteeing no return to a hard border between Northern Ireland and Ireland. My colleagues and I will talk to the EU about how we address the House's views," May said in a statement after the vote. To succeed, May must secure concessions within weeks on issues that have been raked over for months. The EU showed no sign of giving in to the UK. A spokesman for Donald Tusk, President of the European Council, insisted that the Brexit deal "is not open for renegotiation." "The Withdrawal Agreement is and remains the best and only way to ensure an orderly withdrawal of the United Kingdom from the European Union," the spokesman said. Dublin also rejected any attempt to re-open the Brexit deal. "The Withdrawal Agreement is not open for re-negotiation," the Irish government said in a statement. Earlier, the Commons had voted against a proposal to delay Brexit in order to prevent the UK leaving without a deal. The amendment had been put forward by Labour Party MP Yvette Cooper, but was rejected by 23 votes. If passed, the amendment would have secured time for MPs to vote on a draft bill that sought to hand Parliament the power to request an extension of the Brexit negotiations if Theresa May failed to secure backing of her Brexit plans by February 26. The votes came as part of changes sought to the British PM's current proposals before she seeks a re-negotiation of an agreement with the EU, which she will hope is more acceptable to a deeply divided UK Parliament. The House of Commons on Tuesday also rejected a bid by Opposition leader Jeremy Corbyn to force a debate on Labour's Brexit plans. Corbyn's call for more time to be given for MPs to consider alternatives to the Brexit deal was the first in a series of amendments being put to the vote on Tuesday evening. Britain is set to exit the EU on March 29 and there is a scramble to secure a Withdrawal Agreement that is acceptable to all sides before that deadline to avoid a chaotic no-deal crashout of the UK from the economic bloc. Different Brexit factions have tabled amendments to Theresa May's exit plan, which she was forced to bring back to the Commons on Tuesday after MPs had overwhelmingly rejected her Brexit deal earlier this month.